April 27, 2010. Petit-Goave, Haiti. At long last, phase one of our project is complete! 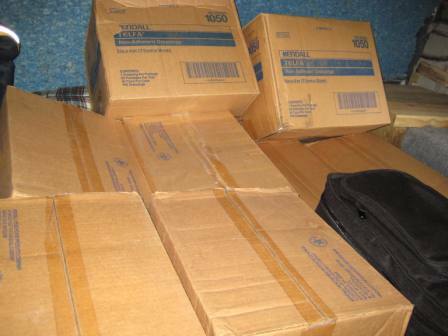 We have completely rebuilt our ship, found and loaded all our medical supplies, sailed our vessel over 800 miles from Florida and arrived safely in Petit-Goave, on the northern coast of Haiti’s southern peninsula. Our last port-of-call in the US was Miami, our jump-off point for the long transit southeast to Haiti. 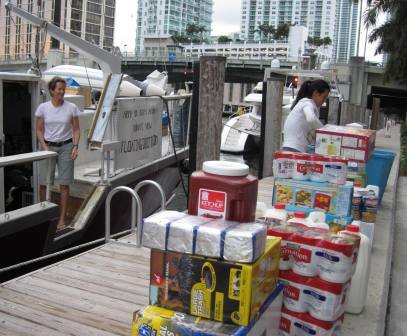 Miami Beach Marina and Epic Marina donated dockage for us while we provisioned, continued stowing and securing our supplies and waited for a weather window to cross the Gulf Stream. Moving from Miami Beach Marina to the Epic Hotel dock was a bit tricky. 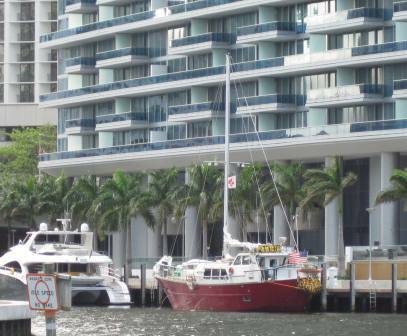 The Epic Marina is on the narrow Miami River. It had a ripping current flowing into it when we came in, and we had a strong wind blowing behind us, pushing us along the current. When they gave us the docking instructions, they told us, “You can’t miss it—the spot where you guys should dock is about 200 feet long, right between the two mega yachts; be careful because the one in front of you just had a 2 million dollar paint job!” We parallel parked without incident and spent two days provisioning and waiting for the weather to clear. At the dock lots of interested passers-by dropped in to talk to us about our project. One fellow from Cork, Ireland, stopped by to say he had been following us online. He relayed the good wishes of some mutual friends back in Ireland from my days training and practicing medicine there. A couple on another yacht gave us some deck cushions, which were to come in very handy when we had to sleep in the salon while running without our air conditioning units on to save power. We have been joined by sailing journalist Lynn Fitzpatrick, who came to add her extensive, global sailing experience to the crew for the transit to Haiti. Also especially welcomed was Doug Lofland from Kiskeya, a group that has been building a quarry operation about 6 miles west of Petit-Goave. After the earthquake, Doug’s company worked tirelessly to support the small community of quarry workers and bring supplies into Haiti in a World War II landing craft. Doug provided a wealth of valuable information and advice as well as a wireless system for Southern Wind that has been indispensable since we arrived in Petit-Goave. At the 11th hour, just as we were about to cast off, we had a visit from Elissa and Travis, a very nice couple who had walked by the boat the evening before and chatted with us for a while. They were horrified to learn that we had no barbecue—somewhat of an essential item onboard offshore vessels for cooking fish and keeping the heat out of the galley in tropical weather. Our previous barbecue had literally disintegrated in St. Augustine. Elissa and Travis came by and handed us a brand new barbecue that got constant use whenever we had good weather during our transit—thank you so much! 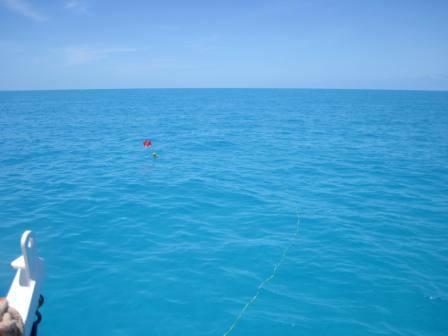 Our planned route took us southeast from Miami to the southern edge of the Great Bahama Bank, a huge expanse of shallow water south of the Bahamanian Islands. We were planning to go all the way around to the north, as we were not sure we could safely make it across the hundreds of miles of sandbars, coral heads and shallows that form the bank. We were fortunate to meet a family cruising on the ship Tranquilty, who had just done the run to Haiti to deliver supplies. They gave us their waypoints, so we could be sure of a safe route across the bank, saving several hundred miles of transit. Cameron and Leigha and their two children, Maya and Finn, as well as their fellow crew member Ali, had delivered supplies and a generator to Jacmel. They were of enormous help planning security precautions and entry and approach procedures. Cameron also went over our vessel’s electrical system and helped us optimize in order to run longer on our batteries and reduce our generator runtime. These good people are hoping to undertake another trip to Haiti in the fall, and if we are still in the Atlantic, we would love to join forces with them. Cameron does renewable energy solutions for boats, and it would be great to see if we could implement some sustainable power sources in Haiti. First, however, we had to get to Haiti, and that meant sailing east from Miami across the northbound current of the Gulf Stream. This was my first time in the Gulf Stream, and it was beautiful. We left the lights of Miami behind us. The water turned a deep blue. The boat started sliding north. We had to steer way south just to move east. My watch ended around 3 AM, and we were still in the deep water of the Gulf Stream. When I woke up a few hours later, I found we had crossed onto the bank. The water had gone from deep, dark blue to bright turquoise—with only 15 feet of water under the boat. For over 200 miles, we cruised through the shallow waters of the Great Bahama Bank—360 degrees of blue on blue around the horizon. It was disconcerting to have such shallow water under our keel, but we stuck close to the line Cameron and Leigha had given us. We had no trouble and no nasty surprises in the shifting sands and unmarked coral heads on the great expanse of the bank. In the open blue, hundreds of miles from anyone, your mind casts about for anything to fix on, and anything unusual is of great interest. Small birds and dragonflies landed on deck to rest. 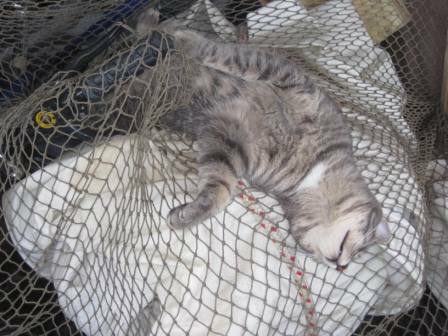 Tweek caught a bird inside the boat, but we took it away and released it unharmed—much to Tweek’s disgust. We saw a rainbow around the sun. On our third day, we saw a rocket launching from Cape Canaveral far astern—amazing! It arced towards the heavens. We saw the booster rockets separate and the main engines fire; the rocket disappeared into space. We watched the two solid fuel booster rockets tumbling end over end portside. We wondered, briefly, if they would land on top of us as they spiraled to earth—until they disappeared in the haze along the horizon on our port beam. We took it as a good omen. We settled into our watches and the routine of shipboard life. Captain Riggs got a haircut from Lynn. A bull shark attacked bait we had out. 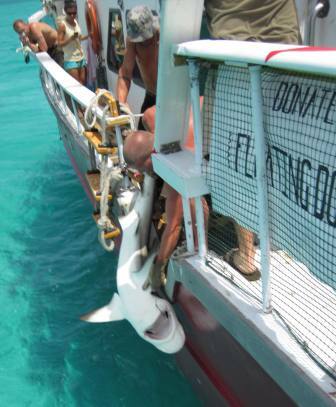 We had to bring it onboard to get our hook back before releasing it unharmed. We stopped once a day and floated free in the blue expanse of sea while we jumped into the sea to cool off as the heat bore down nearer the equator. We stood watches, maintained our systems, ran our watermaker, rotated our food stocks, looked after our four legged crew and sat on the bridge top watching miles of ocean pass beneath us. But peace was not to last. We stopped for one night at Buena Vista Cay on the extreme south eastern corner of the Great Bahama Bank. A low pressure system moved across our position and blew pretty hard over us at anchor for a day. We were sheltered on the western side of this tiny cay and slept well through the night. The next morning, we anxiously checked the weather forecasts on our satellite connection. It was tough to get a signal—maybe remnants of the comet that broke up in the atmosphere recently, or the eruption in Iceland causing electromagnetic disturbance? The forecast called for the weather to lay down and continue moderating for several days. With high hopes, we cruised south east off the shallows of the bank, out from behind the shelter of the Ragged Islands and into the deep water of the Windward Passage between Haiti and Cuba. The weather did NOT moderate as quickly as predicted—for almost 24 hours we beat our way into 10-15 foot seas with very short periods. There were high, gusty winds. Poor Giles and Tweek were both deathly seasick—Tweek in particular was miserable. At his small size, a 10 foot wave is probably the equivalent of 50-foot seas to us. Plus, Tweek (like most cats) has extreme dignity, and when the poor thing was dry heaving on the back deck in front of us, we could tell he was really embarrassed and miserable. The rest of us were pretty miserable as well; all the extra weight of the lumber and materials we are carrying gave our normally stable vessel a nasty roll. You couldn’t set a single item down for a second without it getting thrown to the other side of the boat. Simple things that we take for granted—like making a cup of coffee- became a major undertaking. The cry of ‘One hand for yourself, one hand for the ship’ from myself and Captain Riggs, whenever any of the crew had to go on deck or into the engine room, became a frequently heard mantra onboard. Sleeping for more than a few minutes without interruption became impossible. Captain Riggs spent many hours at the helm without rest, trying to keep us on course and keeping the boat pointed into the weather. 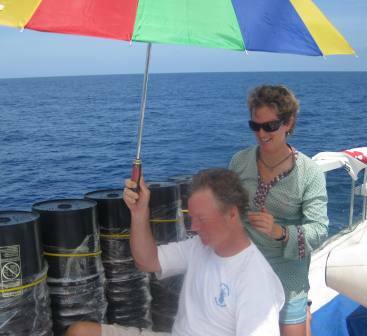 I kept thinking of all the repairs and rebuilding we did and was so grateful, as we pounded through the seas, to all the experts who had shared their years of experience guiding us through the rebuild, because the ship held up well, taking the weather on and beating her way through it, always pointed towards Haiti. I love the Southern Wind. many days away from land, smelling only the salt of the sea, we could faintly smell what Sky calls a ‘carnival smell’-cooking food, smoke, trash, dirt, and that peculiar, hard-to-place odor that comes with the press of many people. 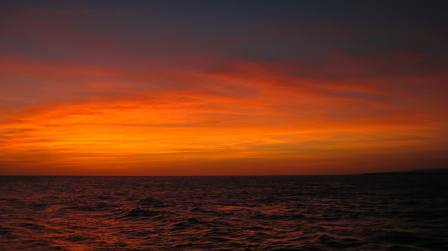 Since we wanted to arrive in daylight, we slowed our approach and crawled forward through the night across the gulf. I was at the helm. Under the full moon I could see the mountains of Haiti in the distance. 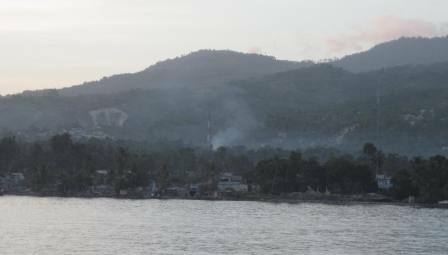 At about 4:00 AM, we arrived in the bay of Petit-Goave. 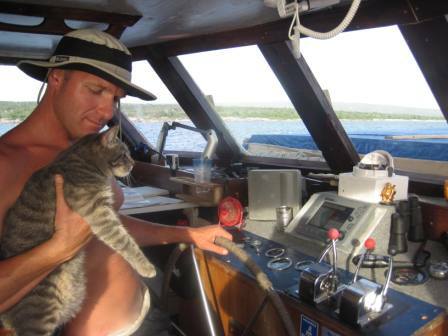 Nick Larsen, Nick Wansten, Captain Riggs and I maneuvered into a promising spot to anchor, dropped the hook in about 35 feet of water a quarter mile offshore from the dock at Petit-Goave, killed the engines and sat back with a huge sigh of relief—we made it! 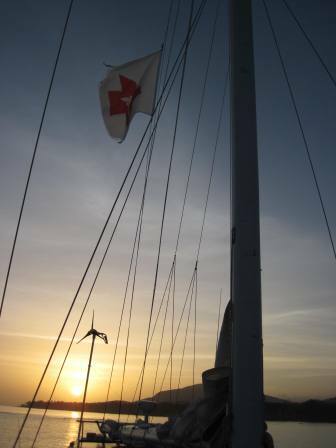 Our mission was to cross hundreds of miles of open sea and shallow banks, carrying supplies and personnel to help others in a country torn by political and economic strife, and, more recently, by the devastation of massive earthquakes. Traveling out to sea, going beyond the reach of easy rescue and assistance, puts you and your vessel at risk. You are dependant totally on that beloved ship that you constantly maintain and monitor and on the whims of the sea and weather and on each other as a crew. We put our lives in each other’s hands. The fact that we can ever even go to sleep at sea with 10,000 feet of water under us, while our fellow crew members are at the helm, is a testament to the trust and faith we have in each other and our ship after working and living together for so many months. Exhausted, but way too revved up to sleep, we sat on deck under the full moon and watched the few twinkling lights of Petit-Goave, heard dogs barking in the distance, listened to the faint sound of music from somewhere on shore as the Haitians began their day Haitians start the day early; by 4:30 lots of people are up and about. We anxiously watched as a few small dugout canoes paddled out in the darkness and took up stations all around us. 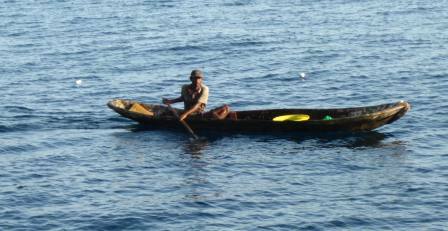 No worries..it was the early birds of the Petit-Goave fishing community. They were out hand-lining for the few small fish left in this blue and beautiful bay. Watching them paddle across the moonlit water was like going back in time to the days of Magellan. 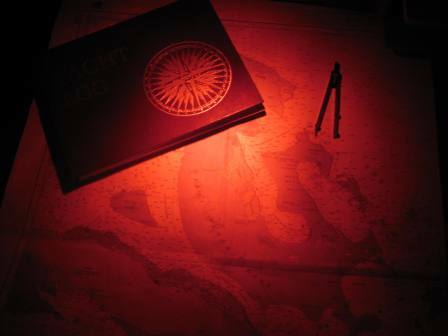 The sun rose, and we could see the same expressions of interest, curiosity and puzzlement at the big red boat that had appeared in their fishing grounds–early explorers and voyagers off the edges of the maps probably saw those same expressions when they arrived in the remote corners of the world. In the growing light piles of rubble, collapsed buildings, smoke and fires became visible over the town. I gathered our documents and prepared to go ashore for our first landing in Haiti. Who knows what is waiting for us out there, across the thin stretch of water separating us from the great need so close at hand? As we have always had to be, we will be adaptable and creative, looking for the best way to serve–relying on each other to stay safe while getting the job done. 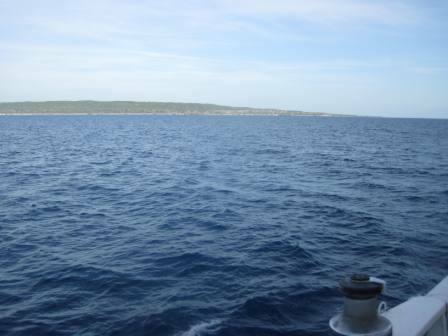 We have arrived in Haiti, and it is time to take our mission ashore.